My name is Denina Simmons, I live downtown in Toronto, Canada, and I celebrate the babywearing movement* everyday! I wear my daughter everywhere, but I find it particularly useful to wear her when I go shopping. I always wonder how the moms at the mall get by with their bulky heavy strollers. It is so much easier to wear your baby and get things done. If you want to try stuff on, just pop your LO out while you are in the change room – or even better ask your husband to come shopping with you and have him wear your LO! 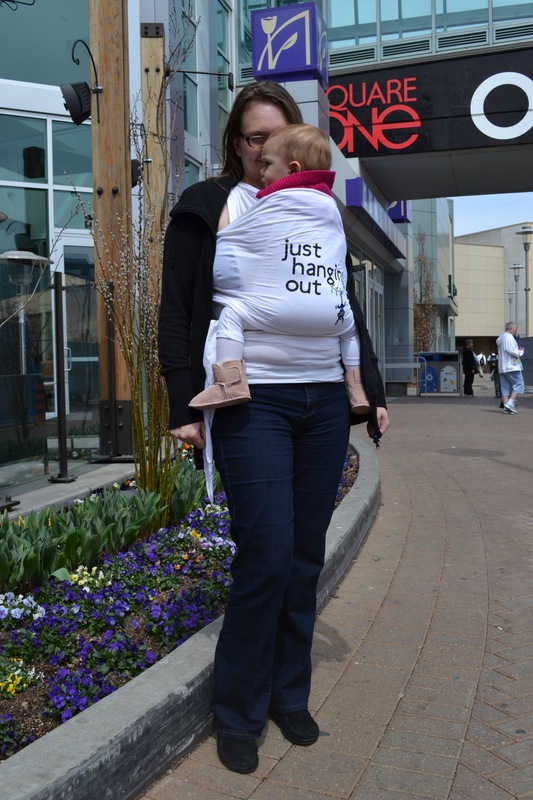 In this photo I am at the mall, and I am wearing my 17 month old daughter in our Little D’s stretchy wrap. That’s right, we still use a stretchy with our toddler. My family loves stretchies! My husband wears her all the time, too. He likes to get her to sleep using the carrier, but also loves going for walks to the park with her safely tucked into the carrier so that he doesn’t have to worry about the dangers of busy downtown streets and rush-hour traffic. Here is a picture of my husband going to the park with our daughter in his Little D’s stretchy carrier … isn’t daddy babywearing the coolest?